Since we're on the subject of zucchini, I thought I'd share my favorite "simple" preparation for zucchini as a side dish. Sorry there's no after shot, but we gobbled them up so fast that I forgot to take a picture. I'm sure I'll be making them again, before the zucchini season is over, so I'll take a picture then and be sure to give you and update. Seriously, when these are nice and crispy...I eat them like candy! 1. 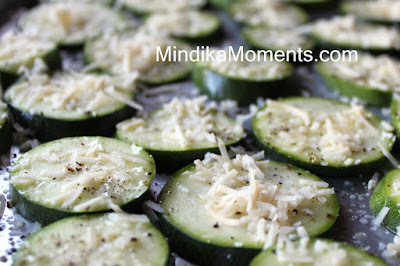 Lay out the sliced zucchini, drizzle with olive oil, sprinkle with salt & pepper, top with Parmesan cheese. 2. Put under the broiler for about 3-5 minutes or until nice and crispy. Sounds deliciously easy! Can't wait to try it! I got zucchinis today at my co-op and didn't know what I was going to do with them since I don't care for them. I'm going to try this recipe tomorrow night. I'll be trying it out on Brent's family (they're moving here tomorrow!). I'll let you know how it goes. Thanks for sharing something so easy! Oh these sound amazing I am trying these for sure. Thank you for this recipe, I made these tonight and I couldn't get enough! They were the perfect addition to our meal. Ooh we love these. I give this recipe out to my clients all the time. They think they're indulging but it's such a healthy snack!